David Judge zeroes in on his target moments before connecting for a three-run home run that provided the winning runs. The game took four days to complete, but in the end one swing made all the difference. 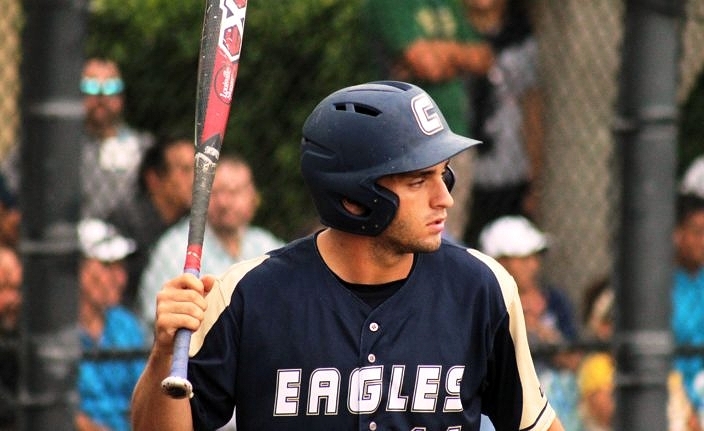 Amidst a nightmare week of rainy weather that forced numerous rescheduling efforts for the 4A-4 Regional Championship, Calvary Christian’s David Judge hit a mammoth home run on Wednesday that decided his team’s fate. Friday afternoon the club finished things off for a 5-0 victory over visiting Florida Christian, which now has the Eagles heading back to the state Final Four for the third straight season. Calvary (15-15) will take on Benjamin in a 4A state semifinal on Wednesday night, at Hammond Stadium in Fort Myers. The Buccaneers advanced to the Final Four following a 3-0 shutout over American Heritage-Delray on the other side of the playoff bracket. Benjamin will be the home team in the meeting between two teams that are plenty familiar with one another. Calvary has been to the state tournament each of the last three seasons, the only three appearances in program history. The Eagles won the 4A title in the 2016 season. The weather took center stage all week in disrupting every effort to get the game played. With only five outs recorded in the action, the first weather delay occurred in the bottom of the first inning on Tuesday. That nearly halted play for the day, before things cleared up enough to allow players to get back on the field nearly two hours later under darkening skies. Roberto Pena had a sac-fly RBI and earned the save in relief action on the mound. Judge made all the fans’ patience pay off, as just two pitches into the return to action he jumped on a 3-1 offering and sent the ball disappearing into the night well over the right field fence. The three-run home run put the Eagles on the scoreboard with all the runs they ultimately needed, while immediately changing the complexion of the game strategy within the added element of the weather issues. Darkness forced the halt of play after four completed innings on Wednesday evening, and further weather on Thursday again pushed the return to play to Friday afternoon. With Eagles starter Christian Scott no longer available to return, Roberto Pena took over on the mound to close out the victory. Pena dealt with base runners in all three innings of work, but managed to escape unharmed each time. The Patriots (21-9) threatened with their best chance to get back into things after loading up the bases in the top of the seventh inning. 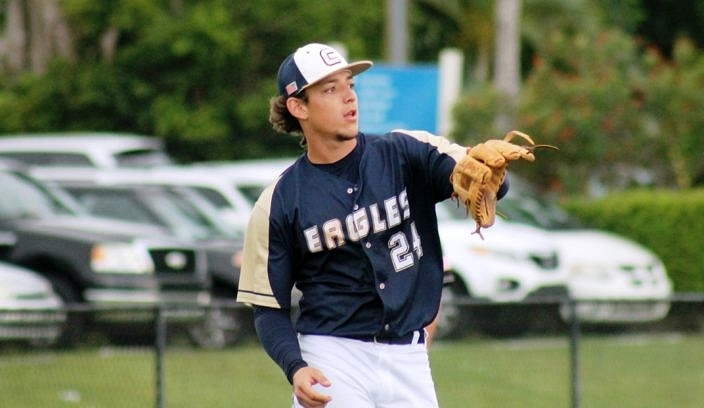 Ricky Macias reached on an error, Jimmy Heyworth singled to center and Brandon Garcia walked to fill the bags and keep Florida Christian fighting to the conclusion. Pena responded with a big strikeout, and an infield grounder followed for the final out that stamped Calvary’s ticket back to the state tournament. The Eagles also received some added insurance on Friday to make things easier. Mykanthony Valdez singled, advanced on sacrifice bunt from Ryan Keenan and scored on an RBI single from Ben Rozenblum in the fifth, and Pena drove in Raynel Delgado with a sac-fly RBI in the sixth.